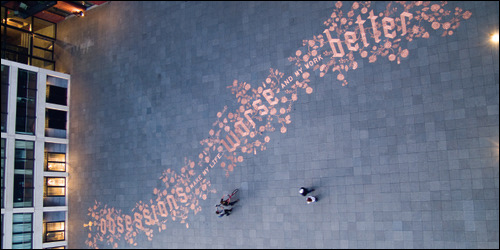 “Obsessions make my life worse and my work better” by Stefan Sagmeister. Photo by Jens Rehr. I created Urban Play for the city of Amsterdam in collaboration with Droog Design to explore open approaches to design, public space and creativity in the city. At its core, the concept I created was this: instead of taking the usual approach towards urban design, in which objects and areas are created to prevent alteration and intervention by the public, what if we created a series of urban design which invited it? Urban Play transformed public spaces in Amsterdam into creative platforms where people could interact, alter and rework a series of public design installations. To use a software analogy, the designs were installed in version 1.0, and it was up to the public to develop them into version 2.0 through individual and collective creative intervention. I directed a team of 12 designers and architects from around the world, including Stefan Sagmeister, Marti Guixe, NL Architects, Korea’s Nothing Design Group, India’s Gunjan Gupta, and Argentina’s Designo-Patagonia, among others. The event was popular in Amsterdam and generated a vast amount of global media coverage. 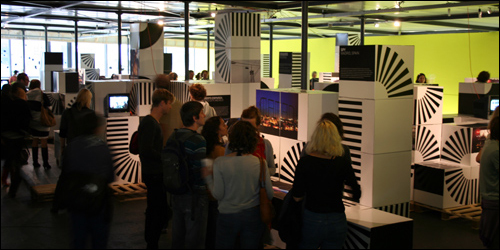 The Urban Play exhibition provided a global overview of urban design interventions done outside of the formal channels of institutions, commissions and urban planning in cities around the world. 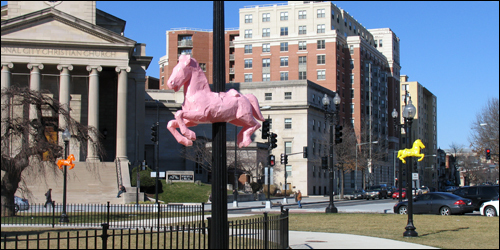 Some refer to it as guerrilla design or “3D Graffiti”, but this surge of urban creativity – from billboards that are visually remixed, to streetscapes which are morphed into theatrical areas in the middle of the night – is where creative expression in the city becomes physical, literally transforming cities around the world. Featuring an unparalleled collection of work from 18 of the world’s most talented urban interventionists curated by me, the exhibition explored how this latest wave of interaction with the urban landscape is challenging the rules of engagement between citizens and sanctioned urban creative expression – moreover, how it is changing the language of creativity in the city. While some social attitudes have previously dismissed urban intervention as a form of vandalism, at the heart of this current wave of DIY urban design is in fact a deeply sophisticated movement driven by artists and designers who want to expand our relationship between creativity and the city. Done without permission or commissions, the vast range of work on display represents the intersection of the latest genre of street art and the beginnings of open source urban design. Droog Design and I assembled a team of some of the most innovative designers and architects from around the world to create 12 newly designed interventions, tools, toys and objects that are temporarily placed along a route on the central IJ-riverfront in Amsterdam. 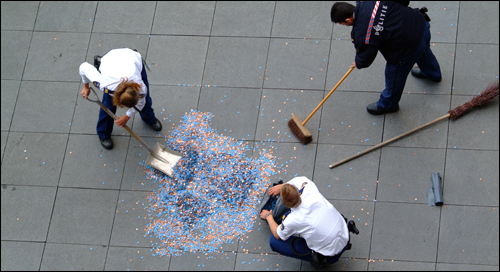 Reversing the traditional approach to urban design, in which objects and areas are created explicitly to discourage public interaction and intervention, this collection of objects were created to encourage interaction and physical engagement by the public. Urban Play poses the question that we hear so much about the “creative city”, but when to we actually get to see it in action?